Remember when 24-36 exposer film was the way of life for a photographer? Now days we can shoot 400 pictures at a time before we need to change our card. Remember when we would shoot one frame at a time? Now days we can capture 11FPS, and get the perfect shot later in post. Remember when we didn’t know what our exposer, or composition looked like until we looked at the negatives while they were hanging in the shower to dry. Now we can look at the back of the camera the second after we push the trigger. In this series I am going to go through my history of photography from shooting film in High School, to Buying my first DSLR, and now moving into the land of Mirrorless cameras. 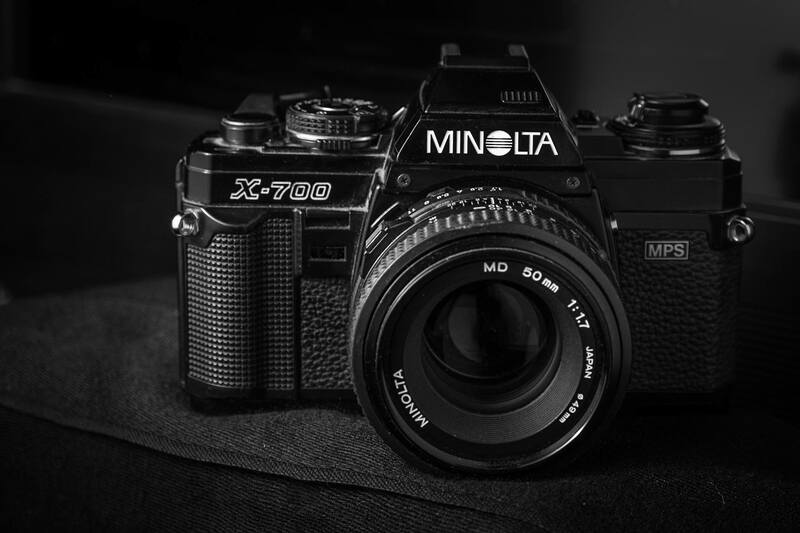 Back in High School I started shooting with a Minolta X700 35mm film camera. This camera had manual focus and a 50mm lens.It had a light meter built in to the body. I took some classes in High School, and learned how to develop both the film, and prints in the dark room. It wasn’t long before I was hooked on photography. At first I was shooting anything and everything that was in front of me. The more I shot the better my images became. After High School I went to a community college for Photography. I thought that I wanted to do photojournalism so I signed up for some english classes along with my photography classes as well. After I had completed a couple semesters, I decided that I needed to get a full time job to pay the bills. I continued to keep shooting as much as I could. I attended a Race car show in Syracuse, NY in 1986 and presented my portfolio to one of the owners of Gater Racing News. Anybody that was into Dirt Modified racing on the east coast read the Gater every week to keep up with the many tracks in the area. So they liked my images and said that I could shoot for them next year. After long Upstate NY winter, spring arrived along with the DIRT racing season.Just before the season started I received my first Press Pass in the mail from Gater Racing News. So the first race of the season that I went to was opening day at Weedsport Speedway. This was my first official gig as a photographer. I was only 19 tears old, and a little wet behind the ears. As I walked into the infield I noticed a few photographers standing in the infield with their film cameras and big flash units mounted to the side of their cameras. I didn’t have a flash so I’m thinking “oh no” I look like a rookie for sure. So I just shot during day light and watched the features from the infield. I talked to a couple of the photographers about what kind of flash they recommended for shooting Dirt Modifieds. So I took their advice and purchased a Sunpak flash for the next week of racing. I had set up a darkroom in my bedroom when I was in collage, so I would shoot the race go home develop the film and then make a contact sheet of the images that I shot that night. Then I would pick a few of my best images and print them on 5×7 paper to send to the news paper. Not only did I have to do all of the developing but, I also had to write on the back of the prints who was in the image, what race it was, and where the race took place. After this process was complete, I would put them in a envelope and send them off to the papers editor. The Gater arrived in the mail on thursdays, so I would get the mail and thumb through the paper to see if any of my images made it to print. The first few issues I didn’t have any pictures make it. 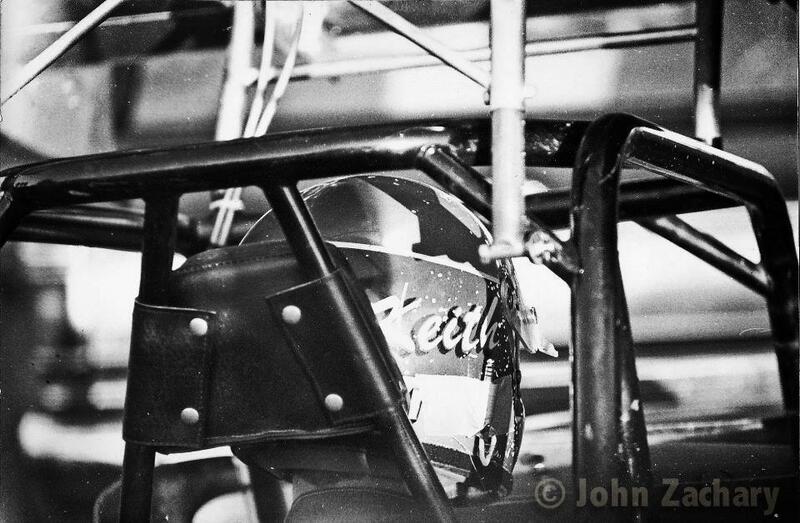 I was bummed, but it pushed me to learn more about shooting racing, and how to get better prints out of the darkroom. I started buying black and white film in bulk and rolled my own rolls of film to save money. At the time we had a camera store in town, so I could just run downtown to buy my supplies if I was running short. Having a press pass was great, I traveled to every race that I could make it to in Central, NY. I figured the more I was shooting the better chance I had to get published. Breaking into the field was not easy. The guys that were shooting had been shooting for a long time, and they were very good at their craft. Most of them gave me advice and tips on how to shoot through the dust and other elements that effected us during a night of racing. 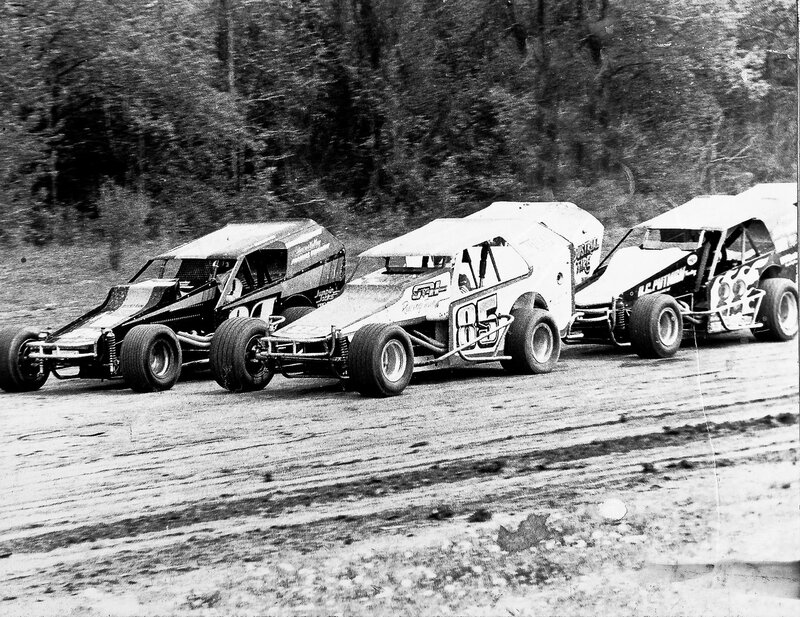 A friend of mine was racing Mini-Mods at Five Mile Point Speedway in Binghamton, NY every Saturday night. I was riding with them to the races every week helping them out with their car on the pit crew. The Mini-Mods parked in the infield, so I started shooting my friend and his class during the nights event. After awhile I started to submit pictures to the Gater of his class, hoping to get a picture of his car in the paper. The track already had a photographer shooting for Gater so my stuff didn’t make it at first, but after a couple weeks Dave From Gater Racing News contacted me and ask me if I would like to shoot every week at Five Mile Point for his paper. So instead of going to every track, and trying to cover everything. I now had a track of my own to cover on a weekly basis. This was great, I was so pumped, and nervous at the same time. Before if I didn’t get a few good shots no big deal, I knew that somebody else did. Now it was me if I didn’t get the shot then shame on me. I had to do the victory lane shots as well as the action shots every week. This went well, I was published every week with coverage from Five Mile Point. It was cool seeing Gater Exclusive by John Zachary under all of my images. During this whole time I was was still shooting with my X700, 50mm lens, and a Sunpak flash. Nobody really used zooms like now days, we all just stood as close as we dared to the track and shot away. We didn’t shoot 11 fps, it was 36 exposer one shot at a time. I still find my self trying to get that one moment with my DSLR instead of just pulling the trigger, and looking for that one shot in post. It was definetly a different way of shooting from what we do now. 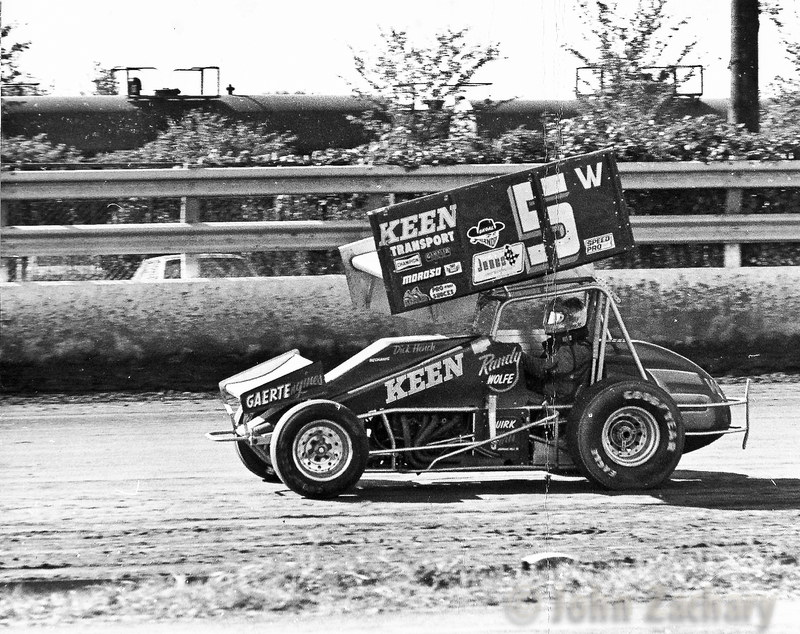 This is a shot of Randy Wolfe during the Super Nationals in Syracuse. This was shot with my Minolta X700, 50mm, and processed in my darkroom at home.It looks like a fast shutter speed was used, I’m not sure what the setting were, but I know it was ASA 400 Tri-X film that I rolled my self. Super Dirt Week is a full week of racing. I can’t remember how may rolls I went though that week, but I’m sure it was a lot. This was shot at Rolling wheels Raceway when I was shooting for Gator Racing news. Another shot from SDW during the Super Nationals. 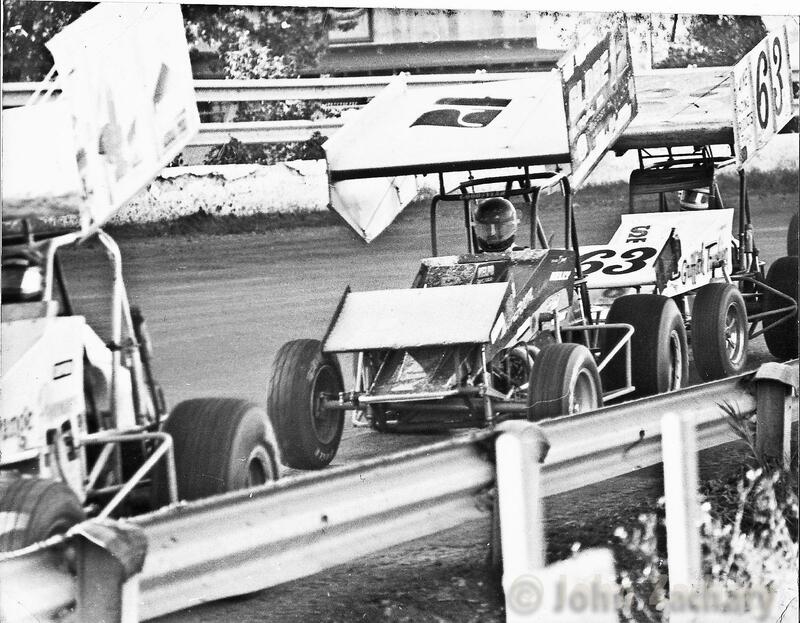 These sprint cars are fast, it was a challenge to get them in the frame, and in focus. I used to pre focus a spot on the track and snap a shot when they entered that area of the track. Its called focus trap it works well. 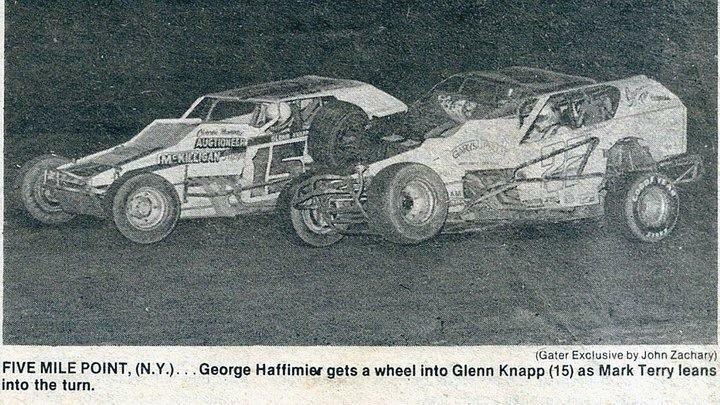 Here is a shot from Five Mile Point Speedway that was published in the Gator. Look at the dust I was shooting through, what a nightmare this was most nights. I shot for Gater for a few years , and then I got married and started a family so my photography was put on the back burner for 20 years. It is a shame that I walked away from it, I was where I wanted to be in the racing scene, and had a good chance to continue in the business for a while. Looking back at shooting film, using one lens, and a flash, life was pretty simple. We had to slow down and think about the shot that we wanted to capture. Instead of hours in front of a computer I spent the time in the darkroom crafting image by image. Every shot cost $$$$$, so I had to make it count. Now days everybody has a camera and shoots a 1000 pictures, uploads them to lightroom and clicks a preset, then gives them away on social media. This makes it hard to make it as a photographer these days. Make sure to check out my next post where l will talk about how I started shooting again after 20 years, but with a DSLR. I also will talk about how hard it was to learn the DSLR compared how I was trained to shoot back in the 80’s. Also how social media has changed the way we look at images. Does anybody print any more? Please subscribe to this blog, and feel free to leave a comment below. I still uses the X700 regularly, one of the best focusing screen I’ve ever seen. I agree I love it. I just shot with mine last weekend.